Finding a cheap car rental in Boston Airport is easy with VroomVroomVroom. We have listed down available rental cars from our partners including Alamo, Enterprise and National so you can easily compare prices and book the vehicle with the lowest rate. General Edward Lawrence Logan International Airport, also known as Logan International Airport, is the largest airport in New England and one of the busiest airports in the United States. The airport is situated at East Boston in Massachusetts and features six runways and four passenger terminals. Logan Airport currently has more than 40 airlines that offer non-stop flights to over 100 destinations all over the globe. Great rates: Our price promise assures you of getting a great deal. Read our TnC for more information. Wide selection of vehicles: We compare a wide range of rental cars including economy, SUV, convertible, and luxury. If you prefer renting an RV for your trip, we can help you find the best RV rental in Boston Airport. Excellent service: We have been helping people book a car rental since 2001. Whether you have a question or need assistance in booking a rental car, feel free to contact us. Coming from Boston Logan International Airport, the city center is just 11 minutes away and it can be accessed via MA-1A S or I-90 W. Before you hop in your cheap car rental in Boston, click here to check the traffic and road situation. You can also find the fastest route using the map. Some travelers headed to Boston will use other, smaller regional airports to avoid the crowds and hectic pace of Boston Logan, and book a rental car to travel into Boston. One option is Manchester-Boston Regional Airport in Manchester, New Hampshire (44 miles northwest of Logan), which results in a 45-50 minute drive to Boston on Interstate 93. Another possibility is T.F. Green Airport in Warwick, Rhode Island, which is 63 miles southwest of Logan. It takes about 70 minutes to drive a cheap car rental from Warwick to Boston on I-95. Getting to and from the airport is a breeze and you can choose from several ground transportation options – from shared van rides and regional bus services to limousines and rental cars. To help you find your way within Boston Airport, check out their official website. There is a wide selection of rental cars in Boston Logan Airport and you can now find them at the Rental Car Center, which consolidates all of the leading rental car companies in Boston. The RCC is located at 15 Transportation Way in East Boston. The facility features a four level garage that offers around 1.3 million square feet of parking space and check-in space. There is a non-airport shuttle that can take passengers to the Rental Car Center, but there are some who prefer picking up and dropping off their vehicle at the airport. It is important to know which terminal you need to go so you wouldn't get stressed out reading signs and missing a turn. If you are picking up someone at the airport, you can stay at the “cell phone lot” at the airport where you can wait for 30 minutes. It takes about 10 minutes to the terminal one you get a call from the person you're picking up. If you think the passenger will take more than 30 minutes to get out of the airport, you can park in the South End or Seaport district. If you are dropping off someone at the airport, there are designated areas to unload but you can't stay for long as the area is patrolled by traffic enforcers. Traveling can surely make anyone feel hungry, but don't worry because there are restaurants located near the airport where you can grab a bite while waiting for your flight or upon arrival. VroomVroomVroom would like to share our gastronomic guide in Boston so you can satisfy your cravings. Below is a list of our recommended dining venues near Boston Logan Airport. This popular sea food restaurant is located beyond the security checkpoints at Boston Logan International Airport. Near the Delta shuttle gates in Terminal A, Legal's offers travelers a nice place to sit and have contemporary cuisine or cocktails. They also sell pre-wrapped sandwiches and take-out for people in a hurry. Legal's is a great spot if you need to wait out a layover or a delayed flight. This Italian restaurant is situated along East Boston, near Logan Airport. Jeveli's is one of the best traditional Italian places to have a meal in this fine city, and it's only a 1.5 mile drive in your rental car to reach from the airport. They are known for their traditional dishes including the red-sauce classics which has been around since 1924. 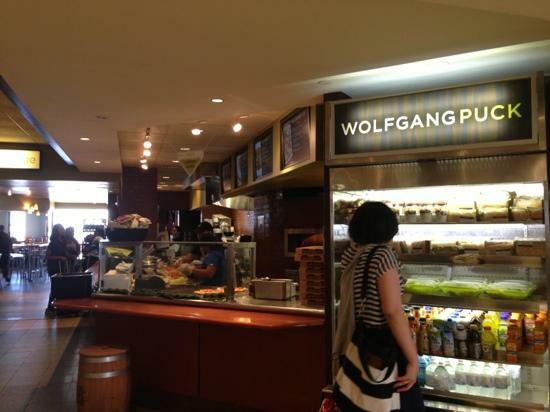 This world-renowned dining venue offers the most popular dishes of award-winning chef Wolfgang Puck. This is your chance to sample his specialties without spending too much because most of the dishes have affordable prices and are served in a casual setting. Why not try Puck's trademark dish, Chinois Chicken salad and an excellent selection of sandwiches, fresh salads, soups, and gourmet pizzas. They only use the finest and freshest ingredients when preparing their food. Advantage Boston Logan International Airport - 100 Tomahawk Dr, Boston, MA. Alamo Boston Logan Intl Arpt - 15 Transportation Way, East Boston, . Alamo Boston Downtown - 1 Congress St, Boston, MA. Avis Boston Logan Intl Airport - 15 Transportation Way, Boston, . Avis Boston Harbor Waterfront Parking Garage - 270 Atlantic Avenue (1st Floor Lobby), Boston, . Avis Government Center - 3 Center Plaza, Boston, . Budget Boston Intl Airport - 15 Transportation Way, Logan International Airport, East Boston, . Budget Boston Waterfront Ma - 270 Atlantic Avenue, Waterfront Park Garage Lobby, Boston, . Budget Boston Government Center - 3 Center Plaza, Government Center, Boston, . Enterprise Boston Logan Intl Arpt - 15 Transportation Way, East Boston, . Enterprise Chelsea - 324 Marginal St, Chelsea, . Enterprise Westin Waterfront - 425 Summer St, Boston, . Enterprise Government Center - 1 Congress St, Boston, . Enterprise S Boston Seaport Dist - 230 Dorchester Ave, South Boston, . E-Z Boston Logan International Airport - 100 Tomahawk Drive, Boston, MA. Dollar BOSTON LOGAN INTERNATIONAL AIRPORT - 100 TOMAHAWK DRIVE, EAST BOSTON, . Dollar BOSTON - PARK PLAZA, MA DLE - MOTOR MART GARAGE 3 COLUMBUS AVENUE, BOSTON, . Thrifty BOSTON LOGAN INTERNATIONAL AIRPORT - 100 TOMAHAWK DRIVE, EAST BOSTON, . Thrifty REVERE, MA TLE - 40 LEE BURBANK HIGHWAY, REVERE, . Thrifty REVERE - LEE BURBANK HWY - 40 Lee Burbank Hwy, Revere, MA. Thrifty BOSTON - PARK PLAZA, MA TLE - MOTOR MART GARAGE 3 COLUMBUS AVENUE, BOSTON, . Thrifty BOSTON - PARK PLAZA - 3 Columbus Ave, Boston, MA. Hertz Boston Logan Intl Ap - 156 Tomahawk Drive 42a, Boston Logan, . Hertz Boston-30 Park Plaza - 30 Park Plaza, Boston, . National Boston Logan Intl Arpt - 15 Transportation Way, East Boston, . National Boston Downtown - 270 Atlantic Ave, Boston, .